I feel like for the last few weeks all I have been doing is peeling and slicing apples. I think my hands are actually going to revolt if I pick up one more apple and peeler. I love apple season though, it always brings back memories of apple picking at the orchard and that crisp, sweet taste of an apple picked right from the tree. Orchard fresh apples also signal that my favorite holiday is almost upon us, Thanksgiving! Truly, the best holiday ever. I love that you can come together with family and friends and just share a delicious and extremely large meal. Forget having to shop for hours to find that gift that you just hope the person will want. Nope no gifts, just food, what could be better? Back to the apple muffins though. I made a whole bunch of apple pie fillings and put them in the freezer for the upcoming holiday, but I had a few apples left over. 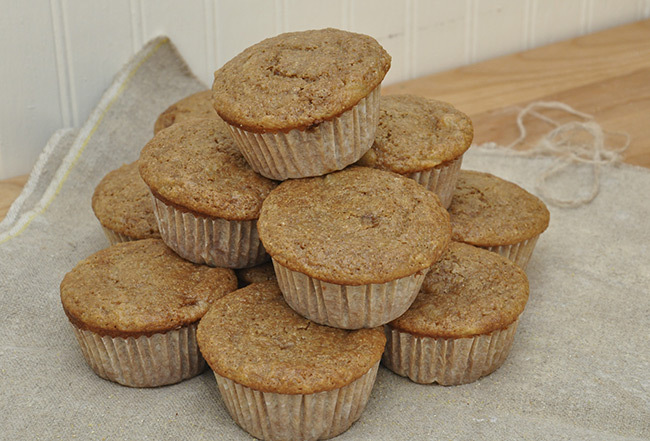 I could have just eaten the apples like nature intended, but I decided to make chunky applesauce out of them for these muffins. These muffins come out really moist and keep for three or more days if you put them in some type of airtight container. My son loves them. Unfortunately, I am not sure if it is due to the taste or how well they smoosh between his fingers, but either way I take joy in his happy face when I put one on his tray. Combine flours, baking powder, baking soda, cinnamon, salt, and dark brown sugar into a large bowl. In a separate medium sized bowl combine your vegetable oil, milk, vanilla, sour cream, egg, and egg yolk. Add the wet ingredients to the dry and stir until well combined. Gently mix in your chunky applesauce. Cover your bowl with plastic wrap and place in the refrigerator for at least one hour or overnight. Preheat your oven to 400 degrees and positioned a rack in the upper third slot. Portion out your muffin batter into a well greased or paper lined 12-cup muffin tin. I like to fill the cups almost to the top. This gives me a muffin with a more pronounced top. Bake for 10 minutes then reduce the oven temperature to 375 and continue to bake for another 10-15 minutes or until a wooden skewer inserted in the middle comes out clean or with a few crumbs clinging to it. Peel, core, and slice 3 large, 4 medium, or 6 small apples. Place the apples in a saucepan with the lid on and cook over medium heat for about 7-10 minutes, stirring occasionally. Since this applesauce is going to go into muffins it does not need to be sweetened unless the apples are really tart. If they are really tart add one tablespoon of sugar to the pot and taste again. I had extrememly tart apples and found that the one tablespoon of sugar did the trick.